Can Case Selection Minimise Conversion Rate in Laparoscopic Colorectal Surgery? 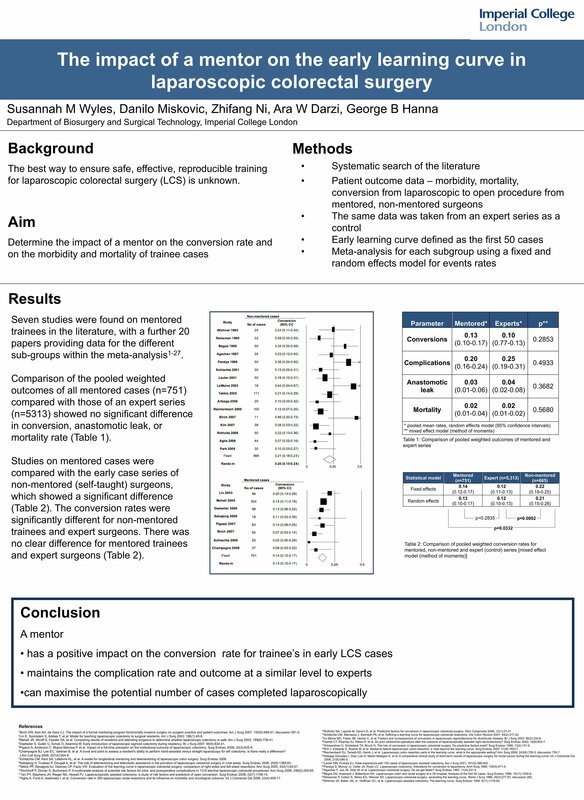 The aim was to systematically review the literature and determine patient factors that increase the risk for conversion.Laparoscopic colorectal surgery (LCS) is notoriously difficult surgery and the dissemination of the technique throughout the UK has been gradual. For trainees in their early LCS learning curve, it is essential to select appropriate patient cases. Although conversion is not a complication in itself it is often considered to be an indication of case difficulty and tends to lead to a longer hospital stay, more analgesia requirements, reduced mobility and the risks or complications associated with these factors. Conversion rate was used as an outcome measure for case difficulty. Two authors performed a systematic search using OVID databases and where applicable further unpublished datasets were requested. A random effects model was used for the data meta-analysis. Within the literature, six studies were identified with a total of 4444 cases. Meta-analysis revealed that male gender (p<0.0001), previous abdominal surgery (p=0.02), a BMI >30 (p=0.005), an ASA score of 3-4 (p<0.0001), the presence of colorectal cancer (p<0.0001) or of an intra-abdominal fistula (p<0.0001), but not age (p=0.61) were factors that led to a significantly increased risk of conversion. There was inadequate data to analyse individual postoperative or intraoperative complications or indeed readmission rates. This meta-analysis demonstrates certain patient factors, in particular intra-abdominal fistulae (OR 4.229, p<0.001), result in a significantly increased risk of conversion. Interestingly age was not an independent risk factor (p=0.61). Careful case selection for trainee laparoscopic colorectal surgeons could therefore result in a reduced conversion rate and hence indirectly help minimise the risk of post-operative complications.